A talk given by Eugene Halliday, transcribed and with arbitrary headings by John Bailey. The drawings aren’t originals, and all editor’s notes are in square brackets. I’m going to draw now. Just ignore me for a little will you please? Does anyone know these symbols? If you don’t, leave the room immediately. Well, they’re called the Fixed Signs in the Zodiac. And normally they are used by astrologers to determine characters and events, and so on. But that is not our use of them. We are not interested in the future, we’re interested in the present, and we’re going to show their present significance. The reason why: because we live in the present and we have never lived at any other time. Throughout the whole of our life it has been Now. And running through now has been time sequence, linear events, and we tend to think that time is passing on, and that we have to catch up with the future. But actually we have never lived other than now. And the real now is total reality which is the Universe with all its powers, all its causal situations … existing now. The Sun exists now, although it’s night- time. The stars exist now, they are all modalities of an Infinite Power which is now and never was other than now. Time is a linear presentation within that mysterious Infinite Now. As Plato put it, time is the moving image of eternity. Eternity is not a lot of time, eternity is Now, eternity is Power, Now, modalising Itself. Now, the first process, the Taurus one, which is the … here [indicating a diagram he’s drawn on the paper] … that one means simply, loop. Take Infinity and loop it. From Infinity, turning inwards to make a loop … and then go back. From Infinity — to Infinity — via the loop. If you don’t loop Infinite Power, you don’t finite it. Now, the finiting, the limitation of that power is exactly the same meaning as creation. Creation is from a base kra which is to arc or loop, to make an ark like Noah’s ark, and to trap inside that sphere — that encapsulation zone, that loop — to trap energy of Infinity. 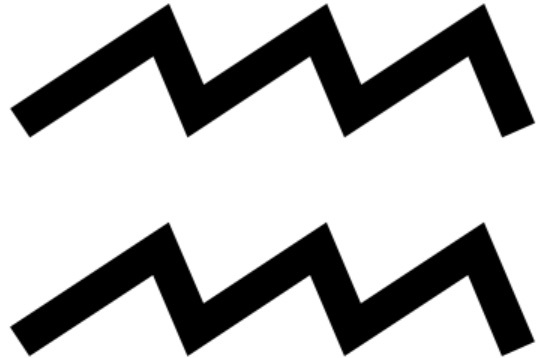 The energy of Infinity is trapped within the encapsulation zone symbolised by that sign that in the Zodiac we call Taurus. Now, we know, by simple experiments with our own being that we have a capacity to do things … like I might lift my leg up and point to my friend Donald over there. Can you see I’m pointing to Donald? What an accurate pointer my foot is. In order to lift up my leg I expended a certain amount of energy. Energy means that that power is in work. En-erg-y means in-work-affirming [en/in, erg/work, y/affirmation]. And I know that I lifted it, I felt that a dualism is impossible, so I can’t have Sentience absolutely different from Power, I can’t have Power absolutely different from Sentience. Power/Sentience must be used together. Sentient Power, S.P., Power Sentience, P.S., these two are aspects of that which is not two. Now, we don’t say they are one, because if we say one we are trying to reduce either sentience or power to the other, or to a third which has these two qualities … namely sentience and power. We don’t resolve it, so we use the term non-dual instead of the term unity. Instead of saying there is only one in the Universe, we say there are not two, that is to say that the a-dvaita, the non-duality of sentience and power. It does not reduce the Sentience to Power, it does not reduce the Power to Sentence, it says the Power and Sentience are not two … but neither can you say that they are one. 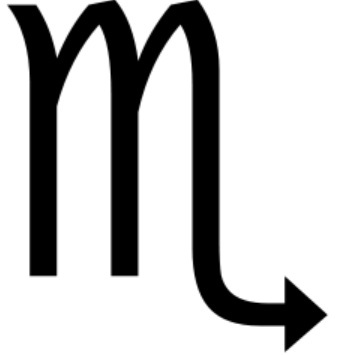 Now, when we make a loop — that is the sign of Taurus — it is the sign of embodiment, so that the sign of Taurus is the fixed sign for corporeal existence. You exist as a physical body because Power/Sentience or Sentient Power have looped themselves, encapsulated themselves, turned themselves into what we call a physical being. Taurus is the mark of physicality of the individual. And the loop, when it turns in upon itself, tends to close, tends to go round and round and keep going. Now the same number is also the number of the state established by man, the state which declares itself to be a being, and to an oligarchy tends to try to rule individuals. But each individual is a triple six like the state is. The national state has to think … there’s a bureaucracy. It has to feel, by various methods of investigating public opinion. And it has to impose force via the army and police on the state. So the state also is six, six, six. And when we wind in in this way, at the moment of contingent stimulation the energy input of A to B, or B to A, tends at the point of stimulation to obscure the behaviour of the being which is being posited from the Infinite. Now all religions are talking about this and about nothing else. They are telling you that if you operate from Infinity and not from contingency, then you are, in fact, a divine being. You are able to divine, to determine, to develop continuously your own being if you operate from the Infinite. 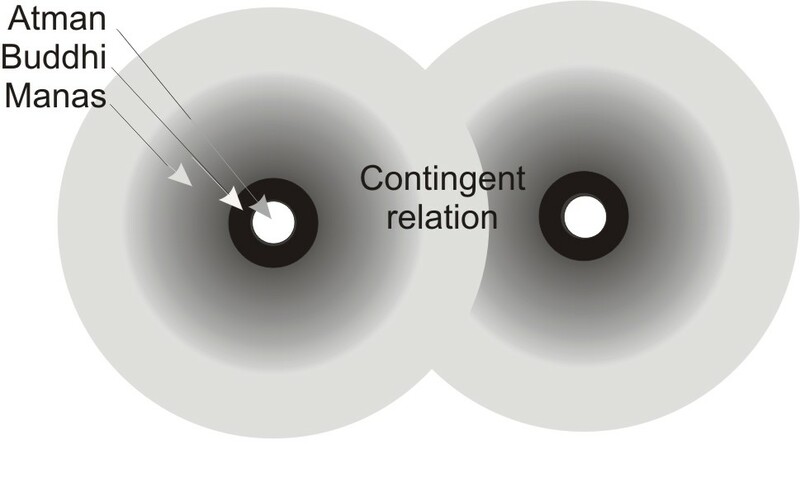 But if you fall into contingent stimulation and are therefore extroverted and focused on another being outside your own zone of encapsulation, the stimulus given to you by the other being determines your behaviour. The moment you identify with an external stimulus you go under the law governing that stimulus. Now, religion is talking about nothing else except how to bind yourself back, re-ligere, bind [-ligere] yourself back [re-] to the original Infinite self-positing. Now, if you fall into external identification with the source of any stimulus, then that source of stimulus from outside you is called an idol. As far as you’re concerned, it has no function for you other than to stimulate you to remind you to go back on your own centre. If you fall into evaluating it as something in itself valid, other than by your observation, and you then proceed to put a value upon it, it is called an idol. It’s called an idol, I.D.O.L. because it’s idle I.D.L.E. … it doesn’t work for you, you work for it. Anything whatever for which you work, whether it’s mineral, vegetable, animal, human, angelic, whatever it is, if you work for it as outside you, as a form which you posit outside your own, then it is for you an idol, and you are an idolater if you do so. And if you do so, the contingent stimulus that is imposed upon you by that being is a determinant of your life and an obscuration of your essential spiritual creativity. N ow, if you are bound up in this way, and through contingent stimuli your rotatory repetitive behavioural system makes you forget your divine or infinite spiritual origin, then you are represented simply by a circle. A serpent with his tail in his mouth is the earliest symbol we have of this. A simple rotatory energy, which has forgotten that it comes from infinity, is posited by Infinity and is actually free to initiate new things. But through its identification it has forgotten that it is free. The free is outside — that’s the Spirit — and the dome is inside … the encapsulation. Now, supposing we did not have an encapsulation zone, and there were no encapsulation zones at all in the Infinite, the Infinite has a peculiar characteristic. Through its initiative — a Uranian thing — through its initiative it is absolutely unstable. It moves unpredictably in fits and starts. It is utterly dangerous, it is continuously re-judging, cutting itself into pieces, and maintains nothing. Imagine therefore, before creation, before the arcing process, before encapsulation, an Infinity of Sentient Power, and the power has no control and just darts hither and thither in Infinity with no prediction power whatever and no stability. It is Sentient Power in a state of absolute chaos. And that Power, because of its instability, decides from itself to make zones of encapsulation. And a zone of encapsulation becomes for it a stable centre of reference. It is a peculiar fact that the anxiety that you see throughout the whole of the animal world — human, and if you know any demons or angels — they are all in a state of profound instability, and they have anxiety. The anxiety in all beings, the anxiety you feel in yourself — and surely daily you experience some anxiety about something — the anxiety is caused by your perception of the instability of the Sentient Power that constitutes your being … anxiety before creation. Anxiety is the state of chaotic Sentient Power before creation. This anxiety precipitates within itself zones of encapsulation on which to lean, and every encapsulation zone that it makes to lean upon in itself, and to enter into, it makes it as a garden, a guarded place like the Garden of Eden. It goes in there to stabilise itself, to make itself so that it is not continuously unpredictably in a state of anxiety. It posits a zone of encapsulation and traps a zone of anxiety within the encapsulation zone. Then all it has to do is go inside this zone and order it. Order means … it’s the same root as the Torah. The T.R. change according to your Grimm’s Law, change T to D and you have this door, this gift from the Infinite to posit stability within the unstable chaos of Infinity. Your anxiety is perfectly obvious if you care to look inside your mind at any time — especially uninterruptedly, say in the middle of the night — look in your mind and see if it’s stable. Within a few minutes you will find that it isn’t stable, it’s continuously presenting you with things, with ideas, with feelings, with impulses … and none of it’s stable. Now, when you make this zone and forget its Infinite origin, and close yourself in it as a result of contingent stimulation, you then feel isolated … you are cut off from Infinity. Now, this cut-offness from Infinity represented here by dome, the serpent with tail in mouth, is the very meaning and the only serious meaning to be attributed to the word sin. To cut yourself off from your creative Infinite Sentient Power is the only sin. Sin means that you have cut yourself off from your Infinite creativity, and now think that you are condemned to be the kind of being you are instead of remembering that in fact you can become any kind of being whatever by remembering your Infinite source, which is essentially creative. In the very moment of self-encapsulation and the forgetting of your Infinity, you find yourself to be a domed being or a damned being, the word’s the same origin. This is a being that is trapped in finitude, trapped in limitation, and it has chaos inside it. Because when that power turned in and tied itself up — the serpent got its tail in its mouth — all the power that was trapped inside that sphere was actually chaotic power from Infinity. So that when you trap yourself to try to make this dome of stability, you find that you have a chaotic Power Sentience inside you which you must then work on. Either you work on that internal chaos, or you spend the whole of your life in a state of unease … a state of continuous, internal self-warfare. So you are in a position where you are domed and you have an internal chaos. And the problem is, How are you going to get rid of the chaos? Now some people have actually done that … actually allowed themselves to get into a position where their death has resulted in furthering of the intelligence of the human race. The most obvious one of the last few thousand years of course is Jesus, who arranged his own crucifixion so that people would get a tremendous shock and realise that they and external authorities represented in his day by the establishment … they and external authorities are fundamentally enemies. The external authority is the occasion of an outer stimulus that obscures y our essential creativity. N ow it’s perfectly obvious that if this encapsulation zone, having observed that it’s trapped chaos which needs to be ordered, suddenly decides to itself, well I won’t do that, it’s too much like hard work, I will open myself. So it opens, and immediately the power that is inside it radiates forth and goes back into the Infinite chaos from which it came. You’re back, not at square one because in the Infinite there aren’t any squares … there are no freemasons in the pre-creational Infinite. 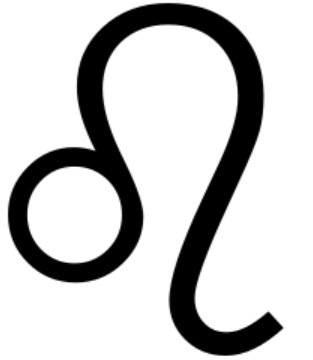 So therefore in Leo symbolizes that you can actually be released back into Infinite chaos. Now that’s a sort of deterrent to suicidal people, because when you destroy your centre of reference, your physical body and your brain and all the references that go with it, all you do is precipitate yourself back into the Infinite chaos from which you derived, and therefore there is necessitated another thought. Thought … that’s form, that is circumscription, a binding line. Feeling … that is liking and disliking. And willing … initiating a change within it. There isn’t anything else to learn. So this fantastical Infinite chaos is not so difficult as it would first appear, because it all comes under the heading of form or idea. Idea is the Greek for form, the shape of things … the affective charge upon things, that is your liking and disliking, and the tendency to insert energy into them to change them. So if you then look inside your mind with very sharp focus looking for form, affective charge, and your tendency to do something about it, you will reduce the chaos very quickly to those three categories. Now power, form and function are the three things to remember. That Power, by in-winding has made form. And then it juggles with the form that it makes, and that juggling about is function. Power, form, function … there isn’t anything else to learn. And if you look inside your mind or your body you will find nothing except forms of power which function when the Power moves into them. The Power first posits the form, then enters the form and moves it about, and the moving about is the function. So you have an arm. Your elbow bends this way, it doesn’t bend the other way very well. If you test yourself with an arm there is a certain amount of weight which you can feel there which you might call the effect of gravity on earth, but you have an ability to lift up. And this ability to lift against gravity convinces you that in act there is power to lift your arm up, and there is power to bend it, and there is power to rotate it, and you can do things with it. Now, every time you expend energy — and remember your body is energy self-condensed — when you expend energy, you formulate it and moving it about, you functionalist it. So that when you do a thing like waving a hand about, you are actually do it through three things, simultaneously. You are using power, forming, and functionalizing … simultaneously. Now, there isn’t anything else to learn. And all the great religions have taught exactly this same thing: power, form, function. In Christianity it is called Father, Son and Holy Ghost. In the Hebrew alphabet it’s called, Aleph, Beth, Gimmel … that is to say an Infinite Power, which encapsulates itself, and then applies itself. Now you are doing it all the time in your thinking, feeling, willing. And to coordinate these three, to stop them getting out of phase, so that what you are actually focused upon is the power that you put into the form, and that you are positing this form by your power. And when the power goes into the form — that is the idea — it pushes the condensed power, which is your body, about, and you are imposing on you in this pushing, a formal function. No one else does it, and you relate to others, and the others striking against you contingently tend to knock you off what you are trying to posit. Try to think of a little thing, doesn’t matter what it is, take a thing you would call problematic, and then let the person next to you start hitting you while you are thinking. Would you like to do that little experiment? All start nudging each other whilst the ones that are being nudged are trying to think of an abstract thing like, say, Spinoza’s concept of the inevitability of God’s mode of operation. Try to think it but nudge each other … really have a go, don’t be shy. Now I want you to imagine that before creation, we, the very same beings which we now are, were in the infinite, yes?, in the infinite, as inter-penetrating spheres — not gross material — spheres of power, and we had nothing better to do than nudge each other perpetually. And the result was the generation of colossal heat. And that heat in religion is called hell fire. That’s the meaning of hell. Hell means that some other silly twit is trying to interrupt you in the midst of your very marvelous self-discovery. And you are just in the middle of getting a brilliant idea to win the Nobel Prize with a new thesis, when some idiot woman comes along and tickles your ears and you forget what you are doing. Or a friend comes along who’s a well-known boozer, and tells you that you are not quite a male if you don’t join him in his drunkenness. And out of sheer lack of his opinion of your opinion of his opinion, you join him. Now this is our state. I want you to understand that. We are eternal power beings, we are monads. We are spiritual encapsulated beings long before the Earth is formed as a gross body in the Solar System. We are zones of Sentient Power. We are unique and we are eternal, and we are always playing hell with each other. And because of this fact there’s tremendous conflagration throughout Infinity. And then, through this tremendous generation of heat, a light is struck. The light is generated by this marvelous heat. And the light suddenly shines through the whole of Infinite space. That light is called the light that never was on land or sea, it is the light of the Logos. It is the light of the Infinite Logic of reality, and it is the product of tremendous infinite mutual jostling. And as the light spreads through those spiritual monads, suddenly they see each other. Before, they were jostling in the dark. Now, they are suddenly in the light and they see what is happening. There’s a jostler next to me. When the eyes were closed you didn’t really know whether it was somebody else or whether it was a tension on your surface or a disturbance in your own being produced by you. By the appearance of light — which symbolises consciousness — by the appearance of that you become aware that there are actually beings near you, contingently stimulating you and knocking you off your infinite, unique contribution to reality. You become illuminated. Now because of the impossibility in the infinite chaos of there being an immediate total agreement of the infinite monads that are there, it follows that the light must have started somewhere before somewhere else, and that light is the one that we call God. The point where the light struck first and spread — that is the meaning of let there be light — consciousness appeared suddenly in the middle of all those jostlings because of the inequality of the heat from the mutual jostling. And that consciousness seized control. Now in exactly the same way, the same law — there is only one law — is applied at every level, going downwards in what we call the involutionary mode from the infinite towards the finite physical body … the same thing is happening. In the jostlings the human beings on this Earth, the temperatures are raised, tempers are lost, and tempers are sometimes retained — temper means balance — and some of them become more enlightened sooner than the others. And the ones that become more enlightened seize control of the situation. If you examine the situation, the power of world bankers, the power of world statesmen, the power of the establishments in all countries, a handful of people who became enlightened before the others, seized control of the situation. N ow in exactly the same way, inside any individual when the power comes in, it has trapped a chaos, it can either be a Leo — give it up and prefer to be free — or it can dedicate itself like the Scorpio attachment, devotion, or when it does so it examines the waves inside itself — looks like the drawing of an oscilloscope screen [referring to the drawing he has just made] — it can examine this chaos inside itself, and observe that in going in it has produced a small model of itself by in-turning and rotating, and producing zones of encapsulation. And it goes on doing this. Because it is power which is infinitely mobile it doesn’t go to the dead centre, because it would then stop. It goes in and then it comes out again. And it goes round and round … it never goes quite into that centre. So we write I.S. 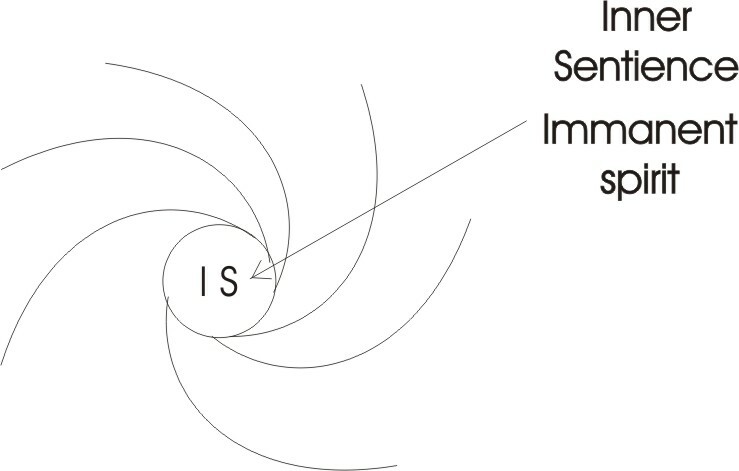 in the centre for Immanent Spirit or Inner Sentience, right in the middle. It cannot be destroyed. The centre of your being is absolutely impregnable because the energy that moves inwards can’t go to a dead centre. It’s got to come out again, and in the process it is rotating and producing lots of little Tauruses. And it goes on doing this, and continuing even inside these, until it comes down to what the physicists would call primary particles. Things like electrons, there may be smaller things than the electrons. The proton, the neutron, the electron, all the other trons that have been discovered … they are all simply loops, rotations of energy, and they’re inside you. And when you examine, when you look inside you, in the act of looking, you create. If you had a perfectly blank mind with nothing in it, and you decided to look in it to see if there was nothing in it, at the very moment you looked you would create something. And if you then thought that this thing which you’d just created was there before you created it, that would be an error. You have created the own object — the object that’s owed to you — by your interest. Consciousness is a catalyst. You create objects in your mind. You know this, because if you’re afraid of something you start imagining the thing you are afraid of. If you hope for something you start imagining the thing you hope for and you can embroider it, you can do an Emily Dickenson dinner plate if you wish, with real lace on it. You can do anything whatever with your interest. It is your interest and no one else’s that is creating your world. Now this is of tremendous significance because it means to say that the world you think you see is a projection of your interest, your imagination, your Sentient Power, your like and dislike, your volitional intention, your ideational power. It is all your own handiwork. Like a man sitting outside the National Gallery drawing a fish on a plate on the pavement with the words, All my own work. You can actually get paid for it, because passers-by feel superior to you and they love feeling superior, so they will throw a trouser button in your plate. Later on you can pawn it. Now, in all the great religions it talks about the transparency of the wise man, of the sage. What it means is that when a stimulus comes to you from another person, instead of rushing out from your centre to meet it, and defending yourself against it if it’s undesirable, or dragging it in if it’s desirable, you deliberately let it go through you, saying to yourself, This is not my infinitely originating self-creative being. It is an external so I will let it go through. I will literally let it go through. Now the cept in percept and concept is from a word meaning to capture. When the stimulus comes to you from anyone at all you tend to grab, to hold it while you examine it, and at the very moment of holding it you have created an object which wasn’t there until you grabbed at it. The conceptual world is a world created by people who, through fear, through anxiety, grab at every energy as it comes in. Think about this, because it is the most important psychological trick you could possibly know about. To make yourself transparent to insult, and to praise, offered to you from outside your being. Lay not that flattering unction to your soul1, and don’t be injured by insults thrown at you by other people who have their own problems anyway. N ow in the Aquarian position the symbol is the waves on water, because the whole universe is nothing but vibratory behaviour of power. There isn’t anything whatever in the whole Universe, the radiations of stars, of the Sun, the behaviours of any kind of power field in inter-space, the energies involved in the mineral world, the energies in the plant, the animal, the human, the angelic, whatever level … they are all vibratory behaviours of power. There isn’t anything that is not Sentient Power, and it is vibrating. But as we’ve seen, the vibratory behaviour can be looked at in a three-fold way. Now how can you be afraid if you know it’s only Power and that the Power is eternal and infinite, and there is only form posited by the Power, and there is function of the Power through the form, or of the form energised by the Power? Where is the problem? There is no problem. Nevertheless, the inertia of previous thinking patterns, the inertia of your training — the inertia of an oligarchally imposed educational system that teaches you to be living in a competitive society in which you have to protect yourself against the contingent stimulation of other beings — the inertia of that in your mind tends to inhibit you. Now apart from the generalised anxiety that people suffer from — which has its root in the Infinite chaos — there is guilt. The word guilt means the will [GUIL] is crucified [T]. When you are in the state of guilt, you are expecting punishment to result from something you have done … either a commission or an omission. Guilt means that you are anticipating trouble. Whenever you sin — that is, separate yourself from the Infinite — you expect punishment, quite rightly because it will come. That it will come is the meaning of the word karma. As you desire, as you initiate, so you will have to pay, somehow. But if the guilt — the fear of the punishment to come — if that guilt begins to paralyse you, begins to focus you down … your sin increases. That is to say, your separation from the Infinite increases to the degree of your consciousness of your sin. So that to be conscious of sin and to be guilty, and to hold on to the guilt and to anticipate possible punishment, is an increase of the guilt, is an increase of the sin, and this is the rationale of forgiveness. Forgiveness is the technique whereby you know the guilt doesn’t mean anything other than you put yourself in a limited situation by your identification, and therefore have invited, by your own separativity a punishment from the powers beyond your zone of encapsulation. When you do that you for give yourself … that is to say, you release yourself from the identification. When you release yourself from the identification then your guilt vanishes, and you become transparent. The thing, the energy that you release in that isolated way, cannot come back at you and harm you in the same way that it could if you retained the identification … if you throw the identification away. Now all religions are about sin and guilt and punishment and redemption. They’re all about this technique of knowing that you precipitate your world, and you, by your identification with the things you precipitate, expose yourself to the reactions of other beings to your creations. And the moment you realise that — make it real to yourself in act — you stop precipitating the world in that way, and you make yourself transparent to the insults and flattery of other people, and you let their statements go right through you and you focus on what you really are. In verity, it’s become what thou art. You are Infinite Power self-wound-in to create order in your own being … not to be disturbed by the contingent stimulation of other beings. Now if you get two beings who know these same rules: Supposing we say we’ll initiate A and B and tell them and they see the truth, then instead of annoying each other to annoy each other, they can actually stimulate each other to enlighten each other by agreement. Yes? Now I want you to watch what happens. You are to consider yourselves both six, right? You are both Infinite beings, and you have precipitated a physical organism … and you have done it. No good blaming your mother and father, because you chose your birth, and you took it into your encapsulation zone … the hereditaments of your mother and father, right? And that’s true of both of you. Now I know you’re not going to fall out with me forever on account of this experiment. If you will please look at each other … do you remember each other? Do you remember Zeta, Trevor? Do you remember her? Have you seen her before? Have you formed an opinion of her? Right. I want you [Trevor], from infinity winding into you, to tell her the opinion you have formed of her. And I want you, Zeta to make yourself transparent … that is to say, you make it as if he hasn’t said these things. Whether they are praises or blame, just let them go through you for the sake of the experiment, yes? And will you [Trevor] give her [Zeta] your … is it going to be your true assessment, please? How do you feel about that as it’s going through you, Zeta? [Zeta, giving a response rendered mostly indistinct by the recording quality] A lot of nasty words to do with limitation. Were you surprised that he’d made any assessment at all? Were you surprised that he could verbalise it? Did you divide it into pleasant and unpleasant components? Well, will you do so and have a look at it. Are they all equal? Are those responses in you identical to the different parts of the statement? What did you say about her first, Trevor? [Eugene To Zeta] How did you like being called a lady in the beginning? [Zeta] I didn’t like it. So there was an affective tone about that? Now what did it say about it? That he’s has not been trained in an aristocratic background? Or does it mean that he knows the etymology of the word lady? [Zeta] I don’t know what he means by that. You didn’t much like that bit, yes? What was the next bit you said Trevor? [no response from Trevor]. Isn’t it remarkable though, really? [Trevor] It was to do with … that it might have been a problem that she would otherwise not have. What was the cause of her having to battle? How do you like that word Zeta? [Zeta] That word wasn’t mentioned. Yes, but a synonym of it was, wasn’t it? There was an equivalent, but you change the emotive charge when you change the term, don’t you? What did you say the first time instead of widowhood? Now, that being true, isn’t it a good idea to learn to be transparent? Because what he said is certainly unknown to the speaker, and what the hearer hears is certainly not what has been said, and what the witnesses bear witness that they heard is not what was said. Now what does this prove? Thank you Trevor, Thank you Zeta. What does this prove about us really? Do we really have charge of ourselves? We haven’t. The reason is because of this chaos. When that initial Infinite Sentient Power that we call Spirit wraps itself up, it captures — conceive means with capture — it conceives a zone … like the Virgin Mary conceiving Jesus, yes? Now the bigger your grab, the more power you’ve got and the more chaos you have to handle. This is why Jesus says, Blessed are the poor in spirit2. [more laughter] If you’ve got only a little bit, it won’t take a lot of ordering about, will it? But if you’re a very energetic character you probably take a great big armful of Universe. Now if we say those four symbols — which are called fixed cross as opposed to four others that are called cardinal and refer to the pre-creational chaos — in that fixed cross is the salvation of the human race. You have to bind yourself … that’s Taurus. You have to relatively loosen yourself or you will become rigid … and the loosening is Leo. You are to dedicate yourself — which is Scorpio — to this process of self-examination of the internal chaos. And bring into it an order by looking inside and discovering Aquarius … that is the sign of memory. Now you know perfectly well that all the things in the Universe are actually nothing but behaviours of power. The Power is Sentient and the Power has made the universe and the Power has made every individual within it, and very individual is that Power in the locus of the individual. So that every individual is absolutely, totally, self-responsible. But because this Power is a continuum — that is to say, is not made of discrete atomic particles — any zone whatever in that continuum is in contact with the infinity of information contained within that Sentient Power. In other words, everybody — whether they know it or not — is actually, innerly in contact with omniscience. There is nothing you could possibly wish to know that you could not find out inside your own being by a process of self-examination. You don’t really need to go out and suffer a contingent stimulus. Once you recognise that you can actually discover in yourself — because you are Sentient Power and the Sentient Power is a continuum — you can discover in yourself, infinite wisdom, omniscience and omnipotence. Now the technique of doing this is simply to look … to become aware. Now you know in Egyptian symbology you have an eye which is called the Eye of Horus, and below the eye you have a straight and a curve. 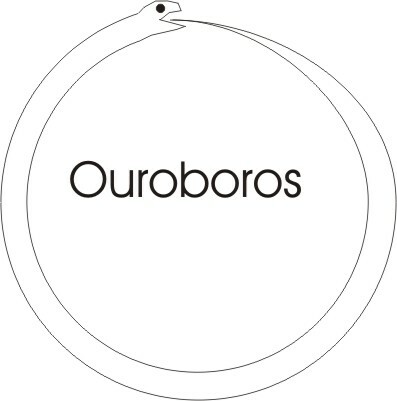 Now the eye is your consciousness, and the straight and the curved symbolise that for which you are to look. 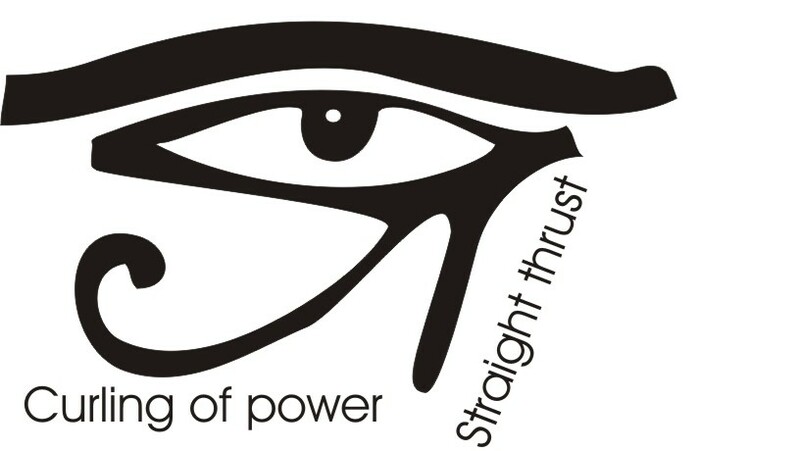 The straight thrust of Power, and the circumlocution, the wheedling, the curling of Power. It is all Power. There is Sentience, there is Power, and it can act either straightly — directly — or indirectly, either a straight or a curling approach. So that whatever you look at inside yourself you look with this concept in your mind: that you are looking for the direct statement and you are looking for the oblique, the curling statement. And by that technique of self, inwards looking you discover that you have actually precipitated your universe inside you. And then you will start seeing peculiar things. First of all, if you look at the European he has, for geographical reasons, developed an extroverted mind. Blame it on the Caucasian Mountains if you like, because most of it started there. The terrain the temperature, the climate, all these things conspired to extrovert the human race in that part of the world, and they became very extroverted and very pushy, very individuated, very ambitious for controlling the external world. We can see this demonstrated because the orientals were pursuing power by an introvert meditation. The occidentals were pursuing power by empirical science. The yogis in the mountains of the Himalayas, sitting up there in perfect tranquility think they have attained their power, and suddenly an intercontinental ballistic missile goes overhead. The low road, the empirical road, has caught up with the introvert meditational. Now the true way is this: when an external stimulus comes to you from any other being of any level — physical, emotional, mentational, conceptual, volitional, from whatever level it comes — instead of you thinking about their opinion of you as expressed by the statement, you don’t. You turn your attention inwards to you, and see what inside you is stimulated into activity by the statement. You forget all about that person as an external being, and you focus on your internal reactivity, because this exposes you to you on the inside. The other person with the contingent stimulus is then working for you whether they like it or not. Every time you take the stimulus — whether insult or flattery — into you and send yourself back into the depths of your inner chaos, which you do by a time stimulus, go back to the situation where this reaction originates, when you go back you then see situations in which you acquired your reactivity to this kind of a stimulus. And you don’t bother about that person at all. And you find these things inside yourself in your own personal reactivity. Your own personal chaos is disturbed and brought up into consciousness where you can bring it to order. And when you’ve done that, then you can say I thank you to the person who gave you the stimulus. Because that person also is of that Infinite Sentient Power and has a function for that power in your development, just as you have with the stimulus contingently that you give to the other person. So in that case you reverse your ordinary process completely. This is a metanoia … a complete change of mind about how to deal with reality. Very, very simple. Your ordinary process is that when somebody says something either praise or blame, you either lay the praise to yourself and are delighted that some fool has this high opinion of you. You don’t care whether it’s true or not, you’re just pleased with the thing said, or you are injured by the insult … even if it was quite irrelevant to your nature. You are so concerned with the other person that you have no time to examine your own, innermost reaction. In the New Testament it says it’s like heaping coals of fire on a person’s head when they do you a bad turn and you return them a good turn3. Why does it heap coals of fire? Because if somebody does you a bad turn and you react immediately with a vicious reaction they feel thoroughly justified. They call you a rude word and you react rudely, and they were quite right to call you a rude word because only rude persons respond in the way you do to a rude remark … so they are totally justified. But if they give you a strong insult and you turn the other cheek on them, that is to say, you do not react as if it’s an insult but you thank them for the interesting stimulus which has reminded you of your great grandmother’s habit of wearing bedsocks during the day. This allows you to assimilate a mystery that would otherwise have escaped you, and you sincerely thank that person for the stimulus. Now that person intent to get at you, not to please you, and immediately it misfires — and this is a rule in magic and in witchcraft — that when a harmful energy’s thrown at you and you take it as thankfully for a stimulus and you say, What a lovely stimulus this is, because he hasn’t produced in you the enmity reaction it was calculated to do, the energy returns and re-posits itself in the mind of the person that sent it out, and that energy overheats, physically, the brain cells. It is literally heaping coals of fire in the brain every time you show a decent response to indecent attack. Now the whole thing is obviously very simple, and we have to remember simple does not mean easy, because of inertia. The inertia of our training, the inertia of the social situation, of competitive upbringing, tells you to hit back. And therefore a large amount of the energies already conditioned in you, trained into you, will wish to carry on with the old reactive process. And you have to capture this energy, you have to encapsulate very quickly, speedily, with the immediacy of consciousness, the tendency in you to react to the attacking stimulus, and capture the energy and immediately penetrate it with consciousness looking at your reactivity. You then make that energy your own and you actually become more powerful on all levels of being. Your consciousness is more powerful, your Will is, your conceptual power, your mentation, your affective power and your physical power is increased by this simple process of encapsulating the enemy’s statement and taking it to bits analytically with your consciousness inside you. 2 Matthew 5:3 Blessed are the poor in spirit: for theirs is the kingdom of heaven. 3 Romans 12:19-21 Dearly beloved, avenge not yourselves, but rather give place unto wrath: for it is written, Vengeance is mine; I will repay, saith the Lord. Therefore if thine enemy hunger, feed him; if he thirst, give him drink: for in so doing thou shalt heap coals of fire on his head. Be not overcome of evil, but overcome evil with good.